The Establishing Shot: The Establishing Shot: Celebrate Georges Méliès films with AIR and the Scissor Sisters (well Scissor Sister) live this week! If you are a regular reader you will now that I was recently bowled over by Martin Scorsese’s brilliant Hugo, which in itself is a tribute to Mr. Méliès and his work. So the timing of this Tribute could not be better and really, well how awesome to reacquaint and immerse myself in the fantastical worlds of Georges Méliès (the father of modern cinema) than this? If you read my review of Hugo and the subsequent conference with Martin Scorsese, Sir Ben Kingsley, Asa Butterfield and Chloë Grace Moretz you would have noticed that my usual sentiment of how the topic or person of the piece influenced my life in some way - in this case Mr Georges Méliès and to a lesser extend Harold Lloyd. It was because at the time Hugo was still a mystery wrapped in an enigma and I did not want to give away any spoilers from the film so kept the focus on the film itself and the team behind it. But I was keen to reacquaint myself with the works of Méliès. You see, during my formative years for a short period I was lucky enough to see some of Mr Méliès films on TV. And for me to remember the details of a TV show that long ago serves as testament to the impact that it must have had on me. The only thing I couldn’t understand back then is why his films never seem to follow on from one another. That is because his films followed a similar format, with the same actors. I always thought they would be better if he serialised them and we got to see the further adventures with the same characters in the fantastical world he created. I’m glad I got to his films that young as a film lover they were the foundations I built my passion and understanding of the art on. So I’m really looking forward to reminding myself of the magic of Mr Méliès in this new and exciting way. The official A Tribute to Georges Méliès announcement:To coincide with the 150th anniversary of the birth of Georges Méliès and the release of Martin Scorsese's film Hugo, an overt tribute to this great master, Ciné Lumière presents an exclusive set of events. Our Classic Medley Méliès programme on 4 December is a unique opportunity to watch what can only be described as a treasure trove of lost gems which were uncovered and lovingly restored by Lobster Films. This is a rare occasion to explore the sublime realm of Méliès' cinema through The Man with a Rubber Head, The Magic Lantern and the colour version of The Devilish Tenant and discover his favourite themes: the moon, space, illusion and the comedy-burlesque. We'll also present the UK Premiere of the restored colour version of A Trip to the Moon (1902) with an original soundtrack by French group AIR on 12 December Lobster Films, Groupama Gan Foundation for Cinema and Technicolor Foundation for Cinema Heritage conducted a complete restoration of the film in 2010, one of the most ambitious in the history of cinema. The film was premiered on 11 May 2011 at the Cannes Film Festival Opening Evening. AIR will join us to speak about their work and the inspiration of their forthcoming album, Le Voyage dans la lune which will be released on 6 February 2012. 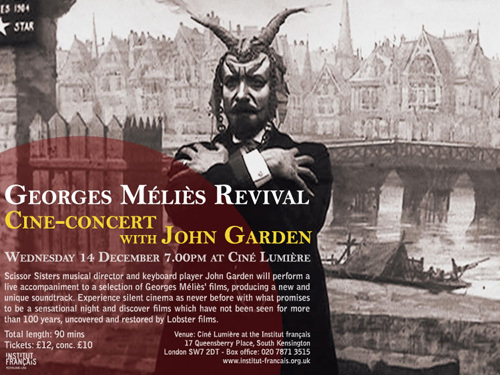 Scissor Sisters musical director and keyboard player John Garden will perform a live accompaniment to a selection of Georges Méliès' films, producing a new and unique soundtrack. Accompanying the films will be an original score of electronic soundscapes which revive and celebrate the sense of magic, mystery and occasional menace that play at the heart of Méliès' films. Experience silent cinema as never before with what promises to be a sensational night and discover films which have not been seen for more than 100 years, uncovered and restored by Lobster films. Wed 14 Dec 7.00pm, £12, conc. £10, total length: 90 mins - tickets here! Discover Georges Méliès’ colour masterpiece brought back to life more than 100 years after its first release. Le Voyage dans la lune (A Trip to the Moon), was released in black and white and also in colour, hand painted, in 1902. 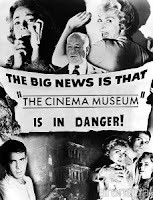 It was an immediate success worldwide and the first blockbuster in the history of cinema. Widely considered one of the most important and influential works in film history, it has inspired Martin Scorsese’s latest film Hugo which comprises several extracts of it and centres around Méliès’ life. The colour version, believed lost during several decades, was discovered in 1993 in Spain, however in very poor condition. Three specialists in film restoration, Groupama Gan Foundation for Cinema and Technicolor Foundation for Cinema Heritage and Lobster Films conducted a complete restoration in 2010, one of the most complex and ambitious in the history of cinema. Eager to put a contemporary spin on this classic silent film, the two foundations approached AIR’s Nicolas Godin and Jean-Benoit Dunckel to compose an original modern soundtrack. The film was premiered on 11 May 2011 at the Cannes Film Festival Opening Evening to immediate and unanimous acclaim. 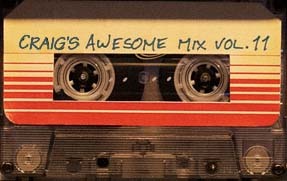 Spurred on by their work on A Trip to the Moon, AIR decided to develop the project into a full album inspired by the film, expanding the original musical themes beyond cinematic instrumentals. AIR’s new album Le Voyage Dans La Lune will be released on 6th February. Internationally revered French electronic music duo, AIR (Jean-Benoit Dunckel and Nicolas Godin), will attend an exclusive screening of Georges Méliès’ cult film A Trip to the Moon shown in its restored colour version. Over at here and tickets over here! The Establishing Shot: Celebrate Georges Méliès films with the Scissor Sisters (well Scissor Sister) and Air live this week!